Mailed 10/24/17 to Subscribers. Allow 4-6 weeks for USPS delivery. 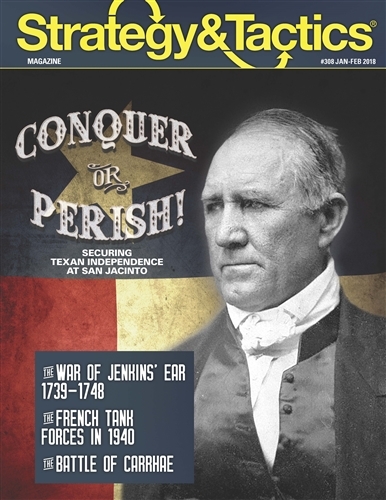 Conquer or Perish - Securing Texan Independence at San Jacinto: Analysis of the Texas Revolution and the pivotal battle that would lead to the foundation of the Republic of Texas. War of Jenkins’ Ear, 1739-1748: European imperial and dynastic ambitions clashed repeatedly during the eighteenth century. In the Caribbean, Great Britain and Spain would face off in the War of Jenkins’ Ear. The French Tank Forces in 1940: Following the end of World War I, France was at the forefront of tank development. By 1940, the French would find their armored forces outclassed by German tanks and tactics. The Battle of Carrhae: In 53 BC, Marcus Licinius Crassus led seven Roman Legions in an invasion of the Parthian Empire. The Romans would clash with the Parthians near the town of Carrhae, resulting in one of the worst defeats in Roman history.